The European markets have chosen a small increase in the beginning of the week. With the gaze inserting several fronts of negotiations (US with China and the European Union for individual commercial contracts, and in the United Kingdom talks between the parties to agree with Brexit), investors take breath while exploiting to insure the rise. Ibex starts the week with an increase of 0.30%, leaving it with 9,497.10 points, at the edge of 9,500. On the side of the losses, Repsol (-0.53%) and BBVA (-0.56%) were the worst values ​​of the session with a decline in oil after six consecutive weeks up, a dash that had not occurred since three years since According to Bloomberg, a report warning of increased oil production activity in the US is wrong to have stopped this rally in the price of black gold. In the rest of Europe, stock markets were closed with modest positive results. The German Dax (0.17%) and the Italian FTSE (0.16%) were the ones that rose most after Ibex. French Cac (0.11%) and Stoxx 50 (0.07%) have quoted virtually flat, while British FTSE has done so at the very end of the session with the same score as it began. Of the sectors, telecommunications, retail and insurance companies, the increases in European markets have increased with increases above 0.70%. On the contrary, the technology sector, real estate and basic resources have accumulated setbacks of up to 0.83%. As for the keys to which investors pay special attention, US Treasury Secretary Steve Mnuchin said this weekend that trade negotiations with China are nearing their final stages, but did not set a deadline. specific. This week, he assured that both he and US trade representative Robert Lighthizer will hold meetings with Chinese Deputy Prime Minister Liu He. "We hope to be close to the final round," said Mnuchin. According to sources near the talks to Bloomberg who prefer to remain anonymous, China would be willing to consider Trump's proposal to transfer to other goods the rates that the Asian giant applies to US agricultural products. In this way, Trump can sell the agreement as a success for American farmers. As the negotiations between China and the United States appear to be on the way, EU governments on the European front have agreed at the beginning of negotiations with the United States to lower tariffs, with the exception of the vote against France and Luxembourg's abolished reputation. The European Union's goal is to eliminate the tariffs on industrial products while the red negotiating line will beto the Commissary of Commerce and responsible for negotiations on 28, Cecilia Malsmtröms, on behalf of agricultural products. In Britain, meetings between Prime Minister Theresa May and Chief Executive Jeremy Corbyn continue to try to reach a pact on Brexit. Can hope to soon reach an agreement on the recall with the Work to avoid if they are forced to participate in the European elections in May, the new MEPs will not have to take their seat in July because then the UK will leave the EU. In addition to the political fronts, the presentation of quarterly results in the US continues its course. Figures from Citigroup and Goldman Sachs are expected on Monday. The experts at Link Securities warn that even though the profit season has started well, 83% of companies' S&P 500 companies outperform profit expectations and 59% hit consensus on sales, we have to be cautious because "analysts have set the bar very low". Despite the caution mentioned by Link Securities, Goldman Sachs has deceived the markets by failing to meet expectations of profits and income, while Citigroup has made a profit thanks to a cut in its costs. In the debt market, the return on the 10-year US government bond falls to 2,553% from 2.56% on Friday. The 10-year-old Spanish stands at 1.082%, 3.2 points higher than on Friday, with a risk premium of 102 points, compared to the previous 99.4. As for the foreign exchange market, the euro gains 0.03% against the dollar and is paid at 1.1302 greenbacks. The pound rises 0.21% to $ 1,3102 and the Japanese yen remains flat touching minimum levels in 2019 to reach 112 yen per dollar. Credit Suisse has entered into an agreement to increase its stake in Credit Suisse Foundation Securities Limited (CSFS) from its current 33.3% to 51%, the joint venture established in 2008 with Founders Securities, announced by the Swiss entity without disclosing details economic aspects of the operation. In that sense, Credit Suisse has announced an agreement with founding securities to, depending on the authorization of the competent authorities, raise its interest in the joint venture to a level sufficient to take control of it. As a result of the agreement with a partner in the investment firm, Founder Securities will reduce its share in CSFS to 49%. Founded in 2008, CSFS is based in Beijing and focuses its operations on the provision of capital market services in the Chinese home market. Since 2016, the company also has operations in the securities market in Shenzhen Qianhai. Ezentis has agreed with Vivo Brasil, Telefonica, to conduct operations and maintenance services for its fiber optic network, the technical company that was detailed on Monday, which has not provided details on the amount or size of the contract. The old Avánzit has confined itself to pointing out that this price corresponds to services in the northern part of the country, so it has already ordered the maintenance of 15,300 kilometers of fiber optics from Vivo Brasil. Last week, the company announced that it had been renewed for more than three years by a contract it had with Telefónica Brasil of approximately EUR 117 million to maintain more than 14,000 telecommunications sites in different regions. Ezenti's shares, which operate and maintain telecommunications and energy infrastructure for large multinational companies in eight countries, will increase 1.6 percent on the Madrid stock exchange. The Portuguese government announced on Monday a reduction in its macroeconomic forecasts for 2019, expecting the economy to grow by 1.9%, three-tenths less than originally forecast. The correction was announced by the Finance Minister of the Portuguese country, Mario Centeno, who assured at a press conference that the slowdown is due to the "reduction in domestic demand contribution", which will go from 2.8% to 2.1% this year. The Portuguese government plans to inject an additional EUR 1,000 million into Novo Banco over the next two years, which will amount to SEK 1,149 million in 2019 after presenting millions of losses over the past year. This is part of the Stability Program 2019-2023, presented this Monday in Lisbon, which will be sent to the European Commission in the coming days. In the document, the government points out that it is necessary to inject 600 million euros in 2020 into the bank and another 400 in 2021, so that the sum during this decade would exceed 2,100 million euros. The new capital injection is known after the company announced losses of EUR 1 422.6 million at the beginning of the year, which led to a capital injection of EUR 1 149 million. Citigroup has announced a profit of $ 4,710 million in the first quarter of 2019, 2% more, representing $ 1.87 per share, over analysts' $ 1.8 forecast. Revenues amounted to SEK 18,570 million in line with the estimate. The company repurchased its own securities for $ 4.060 million and distributed 1,080 million through dividends. Correos has strengthened its staff by 4,500 contracts to handle the vote by correspondence from Valencia's regional and general elections next Sunday, April 28, which will force the public company to open its offices even on public holidays, even though it is a holiday. Citizens who want to vote by post in these electoral processes have until Thursday, April 18, in each post office request a certificate of registration in the election bill, which is an important requirement for being able to vote through correspondence. The twenty-eight have given the green light, with the only voice against France and Luxembourg's closed, the guidelines for the European Commission to negotiate both regulatory cooperation and the abolition of tariffs for industrial products, including the automotive industry. The Commissioner for Trade and Responsible for Negotiations for 28, Cecilia Malsmtröm, stressed that the contacts "will be strictly focused" on industrial products, but have argued that the restrictions will not prevent touching "sensitive" sectors. The EU Council on Monday made the political agreements in the European Union (EU) which required car manufacturers to reduce CO2 emissions by 37.5% for cars and 31% for vans by 2030, taking into account the values ​​of 2021. "We are moving the transport sector on the right path to clean mobility, which helps the EU industry to modernize and strengthen its global competitiveness," said the Commissioner for Energy and Climate Action, Miguel, in a statement. The official agreement today confirms Parliament's vote on March 27 and concludes the final adoption of rules that will help reduce emissions of Europe's mobility sector, says the EU Executive Director. The European Commission (EC) on Monday gave the green light to the acquisition of exclusive control of the Spanish company specializing in the management and marketing of Altamira assets by the Italian doBank, a subsidiary of Japan's SoftBank, a telecom company. The social secretary said in a statement that the business did not give rise to competence competitions given the limited overlaps and links between the companies' operations. Altamira manages unsuccessful assets, including bad debts, and real estate assets to financial institutions, institutional investors and "bad banks", while Softbank operates in several industries, such as telecommunications, the Internet, robotics and clean energy. ACS has been awarded in the state of Florida, in the United States, the contract for the expansion of a I-95 freeway route through Browards and Palm Beach counties, a project of EUR 132 million, according to has informed the company this Monday. This extension is the third contract the company has achieved over the past three years, all through its local subsidiary Prince Contractring. In total, the three projects amounted to EUR 366 million. The National Securities Market Commission (CNMV) has issued a warning to eleven entities offering investment services without the corresponding registration and authorization to perform this activity. Specifically, CNMV has signaled to financialmasters goldenmrks.com, goldenmarkets.com and Matching Blue Consulting, whose relative is Valentín Atanasov. He also condemned the websites rastreadorfinanciero.com, managed by a person named Javier Crespo Fernández, poloinvest.com, tradegf.com, cryptocapitalfx.com or ehtrade.club. CNMV has emphasized that these companies are not registered in the corresponding register and therefore do not have the right to provide investment services. CNMV warnings about financial beach bars can be heard on the supervisor's website. According to the Bundesbank in a report, German private wealth is increasing rapidly due to a boom on the real estate market. The average German capital was EUR 70,800 in 2017, which is 17% more than the previous survey three years earlier, mainly due to a jump in the value of the first home. The study illustrates some of the effects of the European Central Bank's running policy, which has helped this boom German properties based on lowering the cost of loans. Enrique Dupuy de Lome will leave his position as CFO and CEO of the International Airlines Group (IAG), the holding company of Iberia, Bristish Airways (BA), Vueling and Aer Lingus at the next Annual General Meeting in June, according to the Air Group announced today in a statement. He will be replaced by Steve Gunning, currently CFO of British Airways (BA), whose appointment as President will be proposed to the shareholders at the next meeting. The Turkish unemployment rate is at the highest level for a decade after the increase exceeded the expectations of experts by registering 366,000 new unemployed for one month. Thus, Turkish unemployment was 14.7% in January, compared with 13.5% in December. In total, 4.7 million people are unemployed in Turkey. BBVA and Iren, Italian multiservice, energy and technology companies, have signed the EUR 10 million guarantee that will be used for green initiatives and projects. As reported by the bank on Monday, the guarantees for the line will support group initiatives linked to energy efficiency activities, renewable energy, waste management, water treatment and sustainable transport. In this way, Ireland becomes the first Italian company to certify as "green" a range of commercial banks that will be used in projects with potential impact on the sustainable development goals. AlphaValue analyst Félix Brunotte has decided to change his recommendation to the FCC. The expert recommended buying shares in the company when they invested in selling them. AlphaValue sets the new target price of EUR 12.50 per title. Following the amendment of this recommendation, there are already three analysts who recommend buying shares in the FCC, compared to four who are neutral and two who believe it is better to sell. The creation of new companies increased by 3.9 per cent in the fourth quarter of 2018, which means that the development in the previous quarter was broken, which recorded a small fall (-0.1 per cent) according to the statistics from the General Council of Notaries. . This last quarter, together with the other, were the only ones that showed increases over the past two years, so the creation of companies closed in 2018 with a slight increase (+ 0.8%) compared with 2017. According to the notary public, there is still a big difference at regional level, with falls in seven communities during the fourth quarter of 2018, while those registered in Aragón (-13.9%) and Navarra (-11.1%) are particularly important. During the remaining ten, it has increased, although moderately, with the highest observed in Comunidad Valenciana (+ 7.2%). The wind turbine manufacturer climbed to Ibex's top positions with an increase of 1.3% thanks to a Deutsche Bank report where the German bank shows its preference for Siemens Gamesa over Vestas in the sector. The German investment bank has begun value hedging with a recommendation to buy and a target price of EUR 16.8. The company says in a note that it prefers Siemens Games' largest exposure on offshore and emerging markets, and sees more upward paths. The shareholders of CaixaBank receive a new remuneration on Monday with payment of EUR 0.10 in cash for each of their securities, which corresponds to the additional dividend approved by the company for the profit for the financial year 2018. The dividend total gross amount, which is published every six months, is EUR 0.17. The Catalan bank has already paid EUR 0.07 per share on November 5, while the remaining compensation will be completed on Monday. The dividend distributed by CaixaBank corresponds to 51% of the Group's net profit, in line with the strategic plan 2015-2018. The banking group achieved a profit of EUR 1,985 million at the end of the year, an increase of 17.8% over 2017, so the total agreed to be distributed will be EUR 1,012 million. Which values ​​go higher and fall more in Ibex? The week begins with a positive sign on the European stock exchanges. Within Ibex are the biggest rallies for Acciona, Sabadell and Siemen's Gamesa, while only Grifols, Repsol, Indra and Endesa fall. Deutsche Bank recommends buying shares in Siemens Gamesa and setting a target price of EUR 16.8 per share, which represents a potential increase of 16%. The Finnish Social Democratic Party (SDP) has been the voice elected in the parliamentary elections this Sunday with 17.7% of the votes, only two-tenths in front of Finland's right-wing party, previously known as true Finns. The voice of the SDP will be translated according to the forecasts of 40 of Finland's 200 seats, while the Finnish party will control 39 benches (17.5% of the aid). The election has led to a very fragmented parliament. In fact, this is the first time in the history of Finnish parliamentarianism, where no party exceeds 20% popular support. Behind these two parties is the Conservative National Coalition Party (NCP), with 17 percent of votes and 38 seats. and from the outgoing Prime Minister Juha Sipila (13.8% and 31 seats), the data corresponding to 100% of the audit. The Volkswagen Group expects global sales of its leading brand this year to be in line with the 6.24 million units sold as it achieved in 2018 despite China's sales declining in the first quarter. "We expect sales in the Chinese market to be at the same level as last year, we expect sales to be online last year, or we can even add some growth," says Juergen Stackmann, sales manager by Volkswagen, during the Shanghai Motor Show. The European currency is down 0.1% to $ 1.13, with a 0.4% gain on Friday. ADL Bionatur Solutions doubled sales in 2018, with a sales volume of over EUR 25 million, compared to the 13 million it reached a year ago, with the goal of closing this year with the net result for the first time. The extraordinary costs for the companies' integration, the capital increase and the reorganization of the companies and the increase in the structural costs that are necessary to size the workforce and respond to the signed contracts have affected Ebitda 2018. EBITDA, despite an improvement of 14% over the previous year, was still in negative territory, especially at -8.7 million compared to -10.2 million in 2017. Due to the increase in fermentation activity, the number of employees in biotechnology increased from 240 to 331 in 2018, corresponding to an increase of 38%, in parallel with the increase in personnel costs, which amounted to 13.4 million. British Finance Minister Philip Hammond said today that he sees "very likely" that Parliament is presenting a plan to hold a second referendum on Brexit, although he said the government retains its position to oppose any new vote. "It is a proposal that can happen and it is likely that it will be presented to Parliament at some point," Hammond told reporters as part of the International Monetary Fund's (IMF) joint spring meeting and the World Bank, held in Washington. The board of Endesa has approved the appointment of Juan Sánchez-Calero as the new general meeting, which liberates Borja Prado, who leaves his office after ten years in the company's headquarters. The US bank JPMorgan Chase received a record $ 9,199 million (EUR 8,109 million) in the first quarter of 2019, an increase of 5% over the same period last year, reported by Wall Street. JPMorgan Chase's sales in January to March amounted to $ 29123 million (EUR 25,738 million), 4% more than in the first quarter of 2018. Of that figure, $ 14,670 million (EUR 12,965 million) corresponded to commissions and fees, while interest expense was $ 14,453 million (EUR 12,774 million). Of the divisions, the retail trade was the most important, after sales increased by 9% to EUR 12,154 million. Second, the business and investment banking operations, which fell by 6% to EUR 8,704 million. Bank of Spain has authorized the French company Orange Bank, the mobile bank for the operator Orange, to operate in Spain, as reported by the Spanish unit on Friday. The Efe Agency assures that a spokesman from the French bank has confirmed that he has been authorized by the Spanish Central Bank and added that it is only an "administrative procedure" that is necessary to begin the operation. Orange Bank expects to start operating from September. The US stock markets are opening with increases that would be around the future 0.82% for Dow Jones, 0.60% in S&P and 0.51% in Nasdaq. A positive start to the income season and an improvement in the perception of the strength of the Chinese economy are driving markets. Banco Santander leads the increases in Ibex 35 by accumulating a revaluation of 3.42%, putting the price of its shares at EUR 4.63 per share, the best level since August 2018. The documentary of credit and China is based on 25% of the file number of 2,560 millones, compared to the bank account of the bank and shareholder of the creditors. As far as cargo is concerned, cargo tax rates have been lower than before, with some 16.4% being the beneficiary's net worth. Los beneficios por acción he sido de 1,2 euros cuando see esperaban 1.09. Resurrection results from the default and China will not be able to optimize the inverse of indicative activity of any given company. A total of 65 knots, and a total of 426,000 millones dolder and a total economy, are compared to the grid of the 104.338 millones the dare idea of ​​the spectral magnitude. And estos momentos, the Ibex, or Stoxx 50, the FTSE británico y el Cac francés see anotan subidas the alrededor part 0.40%. Dax y FTSE italiano's desmarcan part resto al anotar to 0.64% y of 0.86% respectivamente. And, regardless of the temporary results and state of the Union, JP Morgan has delivered the 9,180 million euros, up from 5.4% to the last few days. El resultado por acción ha sido de 2,65 dolars, frente a los 2,35 previsto. La producción industrial en España contrasts with 0,4%, although the difference between pasado, mientras que and la eurozona el descenso fue del 0.3%. The connection between the airport and its embargo is 0.3%. And the interanual, with a view to producing and manufacturing the industry of the UE and the Polonia (6.8%), Bulgaria (6.6%) and Hungaria (5.9%), but no use moneda. "(La prórroga) elimina el riesgo de un Brexit sin acuerdo el 12 de abril, que era una de las opciones (…) Un Brexit sin acuerdo habría sido un terrible resultado", dijo Lagarde en la rueda de prensa de inicio formal de la asamblea de primavera del FMI y el Banco Mundial, que se celebra en Washington. El pasado viernes, la agencia de calificación canadiense DBRS mejoró a &#39;positiva&#39; desde &#39;estable&#39; la perspectiva del rating &#39;BBB&#39; de la deuda soberana a largo plazo de Portugal. El fondo español MCH Private Equity y Ardian han adquirido una participación mayoritaria, el 80%, de la empresa de alimentación Grupo Palacios a la firma de inversión estadounidense The Carlyle Group por cerca de 250 millones de euros, según han confirmado a Europa Press en fuentes conocedoras de la operación. Así, The Carlyle Group se desprende de esta participación mayoritaria en la empresa de alimentación, valorada en unos 300 millones de euros, después de cuatro años de presencia en la compañía a través de Carlyle Europe Partners IV. El Consejo de Gobierno del Banco Central Europeo (BCE) ha propuesto el nombramiento de Yves Mersch como vicepresidente del Consejo de Supervisión. El BCE informó la pasada noche de que ha enviado al Parlamento Europeo la propuesta de nuevo vicepresidente del Consejo de Supervisión. Mersch, que nació en Luxemburgo el 1 de octubre de 1949, es miembro del comité ejecutivo del BCE desde mediados de diciembre de 2012, por lo que su mandato termina a los ocho años, en diciembre de 2020. Como miembro del comité ejecutivo del BCE es responsable de billetes, servicios legales, infraestructura de mercado y pagos y gestión de riesgo. Los mercados europeos cotizan en positivo. El selectivo español lidera las alzas con un 0,39% de revalorización. 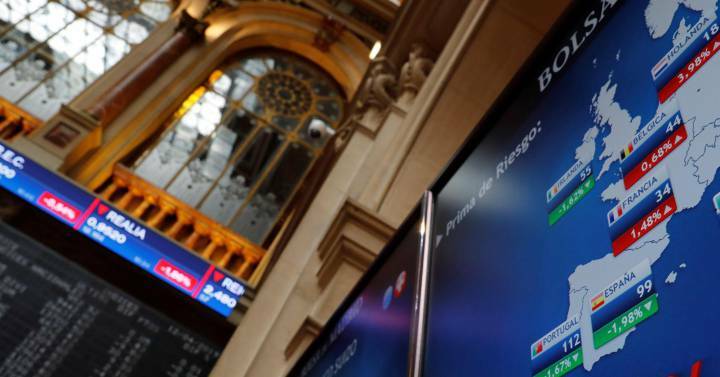 El Stoxx 50 sube un 0,37%, el Dax alemán un 0,36%; el Cac francés el 0,32%; el FTSE italiano un 0,22% y el FTSE británico un tímido 0,08% en la enésima jornada clave del Brexit. El precio de la onza de oro se mantiene prácticamente inmóvil frente a su cotización de ayer. Así, en estos instantes desciende un 0,08% y se sitúa en los 1.303,10 dólares. El barril de Brent sube de precio un 0,28% en estos instantes y se sitúa en los 70,81 dólares por unidad. Los expertos de Divacons destacan que ayer el ministro de Energía de Rusia, Alexander Novak, comentó que no ve necesidad de extender el acuerdo global de producción de petróleo con la OPEP y sus aliados si se espera que el mercado esté equilibrado en el segundo semestre de 2019. Los expertos de Redburn han rebajado su recomendación sobre Siemens Gamesa a neutral. A pesar de que el consenso de analistas sobre la cotizada es en general positivo, (14 recomiendan comprar, 8 mantener y 3 vender) Siemens Gamesa está siendo el segundo valor más castigado del Ibex y cede un 0,59%. El operador aeroportuario español lidera las tímidas subidas con las que ha iniciado la sesión el Ibex 35 después de que los analistas de Kepler Cheuvreux elevaran su recomendación a comprar y situaran su precio objetivo a los 180 euros por acción. El consejo de administración de Elecnor ha acordado proponer en la junta general de accionistas el pago de un dividendo complementario de 0,252173 euros por acción, según ha informado este miércoles la compañía a la Comisión Nacional del Mercado de Valores (CNMV). Con el pago de este dividendo, en el caso de que se aprobase en la junta general, el dividendo total con cargo a los resultados de 2018 sería de 0,307293 euros por acción, lo que supone un incremento del 7,12% respecto del año anterior. Sacyr colocará una emisión de bonos convertibles en acciones por importe de 150 millones de euros ampliable hasta 175 millones de euros y con vencimiento 5 años, según ha anunciado este miércoles la compañía a la Comisión Nacional del Mercado de Valores (CNMV). EL gigante de transporte de viajeros, una de las salidas a Bolsa más esperadas del año, prevé vender 10.000 millones de euros en acciones en la OPV y registrará la operación este jueves, según Reuters. Será la mayor OPV desde la de Alibaba, y valorará la empresa entre 90.000 y 100.000 milones, condicionada por el flojo debut de su rival Lyft. Los mercados de futuros cotizan con tímidos descensos en Europa. El futuro del Ibex se deja un 0,08%, según Meff. El BCE se reúne hoy en Fráncfort para ajustar su política monetaria al actual enfriaminento económico. Los mercados estarán especialmente atentos a novedades sobre los tipos negativos que aplica a los bancos que dejan dinero en el BCE a través de la facilidad de depósito. El presidente de la Comisión Europea, Jean-Claude Juncker, afirmó hoy que espera que la tregua comercial alcanzada por la Unión Europea y EEUU en julio de 2018 "sobreviva a la energía en Twitter de la Casa Blanca", después de que Donald Trump haya usado esta red social para advertir de más aranceles. "Cuando estuve en Washington en julio (…) intentamos llegar a una postura común. Esto llevó seis horas, pero espero que el final provisional de la guerra comercial entre la UE y EE UU sobrevivirá a la energía en Twitter de la Casa Blanca. Esto es importante", dijo Juncker en una conferencia en Bruselas. Añadió que, desde entonces, en las discusiones con Estados Unidos, la UE ha defendido la importancia del multilateralismo en materia comercial. "Los americanos son nuestros primeros aliados y debemos tratar con ellos como tal", dijo. El Ibex cierra con una caída del 0,32% que deja al selectivo en los 9.407,8 puntos. Wall Street abrió este martes con pérdidas y el Dow Jones de Industriales, su principal indicador, bajaba un 0,64% minutos después del comienzo de la sesión, a la vez que el selectivo S&P 500 retrocedía un 0,46% y el índice compuesto del mercado Nasdaq se deslizaba un 0,36%. La Comisión Europea (CE) señaló este martes que hay "incertidumbre" respecto a si España y otros siete Estados miembros de la Unión Europea alcanzarán sus objetivos de energía renovable en 2020, por la que deberían de llegar al 20% en energía verde. Pero no solo la CE duda de España. "Para siete Estados miembros existe incertidumbre sobre si alcanzarán los objetivos de energáis renovables para 2020", indicó el Ejecutivo comunitario en el cuarto informe de progreso sobre la Unión de la Energía, donde se analiza la eficiencia energética, el avance de las renovables y la industria de las baterías eléctricas en la UE. La CE se refiere en concreto a Alemania, Austria, Letonia, Rumanía, Eslovenia y Eslovaquia, además de España. Los principales índices estadounidenses cotizan a la baja media hora antes de la apertura del mercado. Los futuros del Dow Jones, del S&P 500 y del Nasdaq ceden alrededor de un 0,27%. El grupo químico y farmacéutico alemán Bayer informó hoy de que reducirá 4.500 empleos en Alemania en los próximos años, del total de 12.000 empleos ya anunciados a finales de noviembre pasado. Ahora Bayer ha concretado sus planes de reestructuración en Alemania, donde emplea a 32.100 personas y ofrecerá a los empleados de las divisiones de farmacia y agrícola indemnizaciones o jubilaciones anticipadas, pero no hará despidos forzosos hasta finales de 2025. Bayer va a reducir un 10 % de su plantilla, 12.000 de sus 118.200 empleados en todo el mundo, en los próximos años para mejorar su eficiencia. En Alemania, además de en su sede central en Leverkusen, el fabricante de la aspirina también tiene fábricas en otras ciudades como Berlín, Wuppertal, Dormagen y Monheim. Las medidas de reestructuración y las sinergias por la adquisición del fabricante estadounidense de transgénicos Monsanto proporcionarán a partir de 2022 unos 2.600 millones de euros anuales. Global Exchange, multinacional española especializada en ofrecer servicios de cambio de moneda en aeropuertos internacionales, comenzará a operar en el nuevo aeropuerto internacional de Estambul, el quinto más importante en cuanto a tráfico aéreo en Europa. La inversión acometida por Global Exchange asciende a 38 millones de euros y, junto con la apertura de 41 oficinas y la contratación de 400 personas, hacen de la filial turca una de las mayores del Grupo Global Exchange. El productor automovilístico alemán Mercedes-Benz Cars redujo en el primer trimestre las ventas hasta 587.921 vehículos, un 5,9% menos que en los primeros meses de 2018, tras la caída en Europa y Estados Unidos. Mercedes-Benz Cars, que agrupa las marcas Mercedes-Benz, Smart, Maybach y AMG, informó este martes que, por otro lado, las entregas de su principal marca subieron en China. Las ventas de Mercedes-Benz disminuyeron en marzo un 5,6%, hasta las 560.873 unidades, y las de Smart retrocedieron un 12% hasta las 27.048. La marca de la estrella vendió entre enero y marzo 174.343 unidades en China, un 2,6% más, el único mercado donde aumentaron las ventas. PharmaMar ha anunciado el inicio de su nuevo programa de inmuno-oncología, que busca moléculas de bajo peso molecular, inhibidores interfaciales, que bloquean la unión entre PD-1 y su ligando PD-L1. Este trabajo se inició hace más de dos años, con el análisis de las muestras marinas de PharmaMar. La primera de estas moléculas ya se está testando en fase preclínica. Las moléculas de PharmaMar se enmarcan dentro de los antitumorales denominados "moléculas pequeñas", inhibidores interfaciales entre PD-1 y PD-L1, que tienen ventajas frente a otras formas de atacar el tumor. "Una ventaja importante de estos compuestos es que, eventualmente, podrían ser administrados por vía oral, mejorando así la calidad de vida de los pacientes", han señalado. "Llevamos trabajando más de dos años en este nuevo proyecto y ya tenemos una molécula activa que estamos testando en fase preclínica", ha explicado En palabras de Carmen Cuevas, directora de I+D de PharmaMar. El tercer banco de Francia, Société générale, ha anunciado hoy que efectuará 1.600 despidos en todo el mundo principalmente en las ramas de banca corporativa y de inversión con el objetivo de aumentar sus beneficios. El banco que emplea a 18.000 personas en 30 países, despedirá a 750 trabajadores en Francia que se den de baja de forma voluntaria. El resto de recortes serán principalmente en Londres y Nueva York. El movimiento se enmarca dentro del plan que la entidad anunció en febrero de recortar 500 millones de euros en costes. Las compañías que componen el consorcio automovilístico alemán Volkswagen alcanzaron unos ingresos de 18.465 millones de euros en España durante el año pasado, lo que supone un aumento del 6,2% respecto al ejercicio anterior y equivale al 1,5% del PIB nacional. Según anunció el máximo representante de las empresas del grupo en España y presidente de Seat, Luca de Meo, estas firmas cerraron 2018 con unas inversiones y gastos en Investigación y Desarrollo (I+D) de 1.300 millones de euros. La compañía, que calificó de "formidable" esta apuesta por el I+D, se sitúa como el primer inversor industrial en materia de Investigación y Desarrollo en España, con una penetración del 4,7% sobre el total nacional. En estos instantes, Cellnex (4,20%), Bankia (2,50%) y Siemens Gamesa (2,18%) encabezan las subidas del selectivo español. En el lado contrario, Ence (-0,38%), Viscofan (-0,55%) y Mediaset (-0,85%) son los que mayores pérdidas registran. Mediamarkt Iberia ha nombrado este martes a Alberto Álvarez Ayuso como nuevo consejero delegado, según ha informado la compañía. Álvarez Ayuso, que sustituye en su puesto a Per Kaufmann, se incorporó a la compañía en 2001, donde ha ocupado diferentes puestos. Ha sido manager regional de Mediamarkt Ibria y era consejero delegado de la empresa en Suecia desde julio de 2018. En concreto, el Tesoro ha colocado 305 millones de euros en letras a tres meses, frente a una demanda que se ha acercado a los 2.000 millones de euros, y lo ha hecho ofreciendo un interés marginal del -0,415%, más negativo que el -0,405% de la emisión previa. A pesar de que hay pocos cambios en la renta fija, un leve aumento de la demanda en los bonos ha sido suficiente para provocar que el bono alemán a 10 años vuelva a ofrecer una ligera rentabilidad negativa. En estos momentos, se deja cerca de un punto básico y cotiza en un -0,002%. Por su parte, el bono estadounidense a 10 años baja algo más de un punto básico y ofrece un 2,510% mientras que el español para el mismo periodo de tiempo opera con pocos cambios en un 1,081% de rentabilidad. Las acciones del fabricante de aerogeneradores avanzan un 1,3% y se colocan en los primeros puestos del selectivo Ibex hoy después de que Citi publicara un informe en el que es positivo con el sector de las energías renovables. El banco de inversión americana ha elevado sus estimaciones para el volumen de mercado así como los precios de la energía eólica, especialmente en EE UU e India. Mantiene la recomendación de comprar en Vestas y Siemens Gamesa. La cadena de grandes almacenes Debenhams está a punto de entrar en concurso de acreedores después de rechazar de nuevo los planes de rescate del inversor Mike Ashley, accionista mayoritario de Debenhams con el 30% del capital. Ashley había ofrecido suscribir una ampliación de capital de 200 millones de libras (172 millones de euros) a cambio de ser nombrado consejero delegado. Es la segunda oferta de Ashley que rechaza, y coloca a la empresa al borde del concurso. Tiene 720 millones de libras de deuda (619 millones de euros). La inmobiliaria se coloca en el puesto del valor más castigado del parqué con una caída del 8% tras lanzar un nuevo profit warning. La promotora de viviendas anunció este lunes un rebaja del 50% del ebitba previsto hasta 2021, debido al retraso en la previsión del número de entregas de viviendas de ese periodo y, adicionalmente, sustituye a Juan Velayos, su consejero delegado desde 2015. La compañía, que se ha dejado casi un 40% de valor en Bolsa desde su estreno hace justo dos años, ya realizó una rebaja de sus previsiones de entregas de viviendas el pasado año, con el consiguiente castigo bursátil y provocando un efecto de dudas de los inversores que se ha contagiado a todo el sector promotor. El nuevo plan de negocio presentado a los inversores recoge que este año entregarán entre 1.200 y 1.700 viviendas, frente a las 2.000 previstas, y el hachazo mayor llega a partir del ejercicio que viene. Cellnex se dispara a la cabez del Ibex y sube el 3,8% en la apertura después de que Bank of America haya elevado su recomendación para el valor a sobreponderar. La filial brasileña de Ezentis ha ganado un concurso, para gestionar y mantener 14.000 instalaciones de telecomunicaciones de Telefónica Brasil durante tres años. El contrato está valorado en 117 millones de euros. Citi ha elevado sus estimaciones para el negocio de la energía eólica, en especial para Estados Unidos e India. La firma prevé un incremento de la producción de energía del 3% en 2019 y del 6% en 2020, sin considerar a China, y mantiene su recomendación de compra para Vestas y Siemens Gamesa. El ex presidente de Nissan, que volvió a ser detenido la semana pasada tras llevar en prisión desde noviembre, ha afirmado ser inocente y víctina de una conspiración en un vídeo hecho público hoy. Asegura que algunos ejecutivos de Nissan han actuado en interés propio y no de la empresa, y que había miedo a los próximos pasos en la fusión de Renault y Nissan. La colocación de la deuda de la petrolera estatal saudí, Aramco, se está saldando con una fortísima demanda de 75.000 millones de dólares, .67.000 millones de euros. La empresa espera colocar entre 10.000 y 15.000 millones de dólares en bonos a entre tres y 30 años. Los tipos previstos están en torno a 125 puntos sobre el bono de EE UU, es decir, un interés del 3,75%. Los futuros tanto del Ibex como del Euro Stoxx 50 bajan en torno al 0,15%. Los bancos JP Morgan y Wells Fargo estrenan hoy la temporada de resultados para el sector bancario en Wall Street, con las cuentas del primer trimestre. El banco recortará 1.600 puestos de trabajo, de los que 750 están en Francia, dentro de su plan de reestructuración, tal y como ha indicado a los representantes de los trabajadores, publica hoy el diario Les Echos. El presidente de Estados Unidos ha publicado una lista de bienes a los que elevar los aranceles para su importación desde Europa para compensar las ayudas a Airbus, después de que la OMC resolviera que dichas ayudas tenían efectos negativos sobre Boeing. En la lista habría helicópteros, queso, vino, motocicletas o ropa de esquí. La primera ministra británica, Theresa May, viaja hoy a Berlín y París para verse con la canciller alemana, Angela Merkel, y con el presidente francés, Emmanuel Macron, respectivamente. Este lunes, May habló con el presidente del Consejo europeo, Donald Tusk, y con el jefe del Ejecutivo comunitario, Jean-Claude Juncker, de cara a la cumbre extraordinaria que mantendrán los líderes europeos para decidir la respuesta a la petición británica de retrasar el Breixt hasta el 30 de junio. May también ha conversado telefónicamente con el primer ministro holandés, Mark Rutte, uno de sus principales apoyos en el bloque comunitario. El Tesoro Público vuelve esta semana a los mercados con dos nuevas emisiones; una primera de letras a 3 y 9 meses el martes y otra el jueves en la que ofrecerá a los inversores bonos y obligaciones, con las que espera captar hasta 6.500 millones de euros y con la que pondrá fin el calendario de emisiones del mes de abril. De esta forma, el organismo dependiente del Ministerio de Economía y Empresa regresa a los mercados en un momento en el que la prima de riesgo se sitúa en el entorno de los 110 puntos básicos y a punto de empezar la campaña electoral oficial para las elecciones generales del próximo 28 de abril. Así, se ha marcado como objetivo la emisión de entre un mínimo de 4.500 millones de euros y un máximo de 6.500 millones de euros, en línea con los buenos resultados de las últimas subastas en las que los inversores han seguido mostrando su interés por la deuda pública española. La petrolera estatal brasileña Petrobras ha llegado a un acuerdo con un consorcio liderado por la energética francesa Engie para vender el 90% de la gasista TAG por cerca de 8.600 millones de dólares (7.631 millones de euros), según ha indicado en un comunicado. El consorcio está compuesto por Engie, Engie Brasil Energia y el fondo de inversión público canadiense Caisse de dépôt et placement du Québec. De su lado, Petrobras ha subrayado que conservará el 10% restante de la empresa. La participación total de Engie en TAG, sumando a su filial brasileña, ascenderá hasta el 49,3%. Como la empresa gasista estará controlada de forma conjunta, no se integrará dentro de las cuentas de Engie. El grupo BMW ha provisionado 1.000 millones de euros por si tiene que pagar una multa por los supuestos acuerdos con Daimler y Volkswagen para restringir la competencia en el desarrollo y difusión de tecnologías de reducción de emisiones. BMW ha informado de que prevé que el margen de rentabilidad operativa del segmento automovilístico será este entre 1 y 1,5 puntos porcentuales más bajo del previsto hasta ahora entre el 6% y el 8%. El fabricante alemán, que tiene las marcas BMW, Mini, Rolls Royce y BMW Motorrad, sigue pronosticando una notable caída del beneficio antes de impuestos en comparación con el 2018. Fitch Ratings ha rebajado la calificación crediticia a largo plazo de Red Eléctrica Corporación (REE) a &#39;A-&#39;, desde &#39;A&#39;, eliminando el &#39;rating watch negative&#39; y situando su perspectiva en &#39;estable&#39;. En un comunicado, la agencia señala que la rebaja en la calificación de la compañía se debe a que el plan estratégico 2018-2022 anunciado el pasado mes de febrero por el grupo "no respalda una estructura de capital consistente con el nivel de calificación &#39;A&#39; en el medio plazo". Según Fitch, el alto nivel de compromiso inversor a 2022 de la compañía, con un plan de inversión de 6.000 millones de euros, incluyendo la adquisición de Hispasat, junto con la revisión de la retribución a sus actividades de redes prevista a partir de 2020 no se contrarresta suficientemente con el recorte en el dividendo a partir del año que viene. El centro de escuchas británico (GCHQ, en inglés), perteneciente a los servicios secretos del Reino Unido, estudia vetar la "defectuosa" red móvil de Huawei de lugares sensibles del país, como el Palacio de Westminster. Así lo afirmó a la BBC el director técnico responsable de la ciberseguridad nacional, Ian Levy, quien aseguró que la compañía "no ha dado ninguna confianza" de que vaya a cumplir el programa de transformación que pretende implementar. En los últimos meses, varios países occidentales han mostrado sus reservas respecto a la expansión de Huawei y su sensible participación en la creación de las redes mundiales de telecomunicaciones 5G. El mes pasado, Huawei demandó al Gobierno estadounidense por prohibir a las agencias gubernamentales del país el uso de sus equipos por, presuntamente, espiar a los ciudadanos a través de sus teléfonos inteligentes. Está previsto que en mayo el Ejecutivo británico revele si va a restringir el acceso de la marca asiática a la red 5G o incluso prohibirlo. El Ibex retrocede un 0,63% y es el peor índice europeo. El Cac está plano, el Dax cae un 0,24%, y el Mib italiano no se mueve. Los tres principalles índices estadounidenses cotizan con caídas en la preaperatura del mercado. Los futuros del Dow Jones ceden un 0,28%, los del S&P500, un 0,12%, y los del Nasdaq, un 0,17%. Pinterest ha fijado el precio de la colocación en la Bolsa de Nueva York entre 15 y 17 dólares por acción, en la parte alta de las estimaciones del mercado. Esa banda orientativa supone valorar la compañía en un máximo de 9.000 millones de dólares (unos 8.005 millones de euros) y podría lograr unos 1.300 millones de dólares con la colocación de 75 millones de acciones. Los bancos alemanes han reclamado al Banco Central Europeo (BCE) que introduzca un mecanismo para mitigar el impacto adverso de los tipos negativos en las cuentas de las entidades del Viejo Continente, tomando como ejemplo las experiencias de los bancos centrales de Suiza o Japón, según ha señalado el presidente de la Asociación de Bancos de Alemania, Hans-Walter Peters. "Exigimos un rápido final a la penalización que suponen las tasas de interés negativas", ha señalado el banquero germano, recordando que, cada año, los bancos de la eurozona dedican unos 7.500 millones de euros a cubrir el impacto de los tipos negativos de la facilidad de depósito del BCE en el exceso de liquidez acumulado. "Eso debilita a los bancos y no es aceptable", ha subrayado. En este sentido, Peters ha defendido que ni el Banco de Inglaterra ni la Reserva Federal de EEUU han aplicado tasas negativas a las entidades como parte de su respuesta a la crisis. Ikos Resorts ha elegido a la UTE liderada por Acciona Construcción e integrada también por Sando para llevar a cabo, por 55 millones de euros, la reforma integral de un hotel ubicado en Marbella-Estepona (Andalucía), que se convertirá en el primero del grupo griego en la península ibérica. El acuerdo con las constructoras tiene como objetivo la rehabilitación del actual Hotel Princess de Estepona, construido en 2000 y adquirido en 2018 por la compañía para su transformación en "Ikos Andalusia", un complejo vacacional de lujo bajo el concepto de todo incluido, con una inversión de 150 millones de euros. ¿Cuáles son los valores que más suben y más bajan del Euro Stoxx 50? El índice europeo cede un 0,15% a media sesión. Entre los mejores valores destaca el comportamiento de Airbus (1,25%), Engie (1,08%) y Sanofi (0,78%). La peor parte se la llevan Safran (-1,8%), CRH (-1,49%) y Sap (-1,37%). La CNMV ha emitido advertencias este lunes sobre 14 entidades que no están autorizadas para prestar servicios de inversión en España al no figurar en sus registros. Ha alertado de Borneo Trading Group (bortrgroup.com), Techofin Ltd/Broker Yard (brokeryard.com), Capital 245/Elit Property Vision Ltd (capital245.com), Cryptoeu/Columbia Capital Group Ltd (cryptoeu.com), Dividendcare Ltd (dividendcare.com), Eurtrades/Silver Wolf Ltd (eurtrades.com), Blackstone Capital Ltd (pepperdyne.com), Uprofx (uprofx.com) y Emporio Trading Ltd (emporiotrading.com). Asimismo, ha advertido de que socialforex.es, vinculada a Nicolás Ezequiel Bellanza, no está autorizada para prestar servicios de inversión, como tampoco lo está Oncripto/New Digital Bits XXI, SA (oncripto.co), vinculada a Antonio Gabriel Romero Sánchez. Por su parte, la sociedad vip-platform.market no guarda relación con la entidad Safecap Investments Limited. BBVA Research ha rebajado dos décimas su previsión de crecimiento del PIB para este año, hasta el 2,2%, y en una décima su pronóstico para 2019, hasta el 1,9%, con una estimación de 630.000 nuevos puestos de trabajo en el conjunto de los dos años, hasta reducir la tasa de paro al 12% en 2020. Así figura en el informe &#39;Situación España&#39; del servicio de estudios de la entidad, presentado este lunes por el economista jefe del Grupo BBVA y director de BBVA Research, Jorge Sicilia, y el responsable de Análisis Macroeconómico de BBVA Research, Rafael Doménech. Sicilia ha explicado que esta revisión "ligeramente a la baja" del crecimiento español viene provocada, "en gran parte", por una revisión a la baja del crecimiento europeo y también por el cambio de tendencia en la previsión de la serie del Instituto Nacional de Estadística (INE). Renta 4 ha realizado dos cambios en su Cartera Dividendo al sacar a Naturgy y Bankinter, y su lugar lo ocupan BBVA y Bankia. "Es un movimiento táctico, una vez cobrados los dividendos de Bankinter y Naturgy y dada la elevada rentabilidad de BBVA y Bankia con los dividendos que van a repartir la semana entrante", explica la firma de análisis. En ambos bancos tienen una recomendación de mantener, como consecuencia del entorno de debilidad macroeconómica y la falta de normalización de la política monetaria. Con estos cambios, la Cartera Dividendo queda compuesta por Bankia, BBVA, BME, Ferrovial, Iberdrola, Merlin Properties, Repsol y Telefónica. La temporada de presentación de resultados que arranca ya en EE UU tardará un poco más en llegar en Europa. En España, las cuentas del primer trimestre del año comenzarán a publicarse después de Semana Santa. Una de las compañías en dar a conocer la fecha de la publicación es Enagás. Tal y como acaba de comunicar a la Comisión Nacional del Mercado de Valores (CNMV), la gasista publicará los resultados correspondientes al primer trimestre del año 2019 el miércoles, 24 de abril antes de la apertura del mercado. A las 9 horas de ese mismo día, el presidente de Enagás, Antonio Llardén, realizará una multiconferencia/webcast para presentar dichos resultados. El grupo aéreo Air France-KLM, que engloba a las aerolíneas Air France, KLM, HOP! y Transavia, transportó a más de 22,6 millones de pasajeros en el primer trimestre del año, lo que supone un aumento del 3% en comparación con el mismo periodo de 2018, según los datos publicados hoy por el grupo franco-holandés. La oferta del grupo aumentó un 3%, mientras que la demanda se incrementó un 2,6%, con un factor de ocupación del 86,8%, lo que ha supuesto un descenso de 0,3 puntos porcentuales. Excluyendo Transavia, el número de pasajeros fue de 19,7 millones en los tres primeros meses del año, un 2,4% en comparación con 2018. Su oferta fue un 2,3% superior y la demanda un 1,9%, en comparación con el primer trimestre del año anterior. El factor de ocupación se ha situado en el 86,3%, 0,4 puntos porcentuales menos. El tono negativo de la apertura se mantiene hora y media después en las plazas europeas. En el caso de la Bolsa española, el Ibex cae alrededor de medio punto porcentual y pierde los 9.500 puntos. Dentro del selectivo, los mayores castigos son para Aena, que cede un 2,2%, tras un recorte de recomendación por parte de RBC; Cellnex y Sabadell con caídas respectivas del 1,9% y 1,4%. Entre los mejores sobresale el comportamiento de Ence que repunta un 2,5%. Le siguen BBVA e IAG pero con leves alzas del 0,2% cada uno. Los accionistas de BBVA percibirán un dividendo de 0,16 euros brutos por acción el próximo miércoles. Por su parte, los de Bankia cobrarán 0,10 euros el próximo jueves. El mismo día, Ence repartirá 0,054 euros brutos por cada acción. La economía francesa, la segunda mayor de la zona euro, registrará una expansión del 0,3% en el primer trimestre de 2019, según la tercera estimación del dato del Banco de Francia, que ha ratificado su proyección preliminar. En caso de confirmarse, la economía francesa repetiría así entre enero y marzo el ritmo de crecimiento del 0,3% del tercer y cuarto trimestre de 2018. En el mes de marzo, el indicador de actividad del sector manufacturero se situó en 100 puntos, mientras que el dato del sector servicios repitió los 101 puntos de febrero y la construcción repitió los 106 puntos del mes anterior. El comisario europeo de Asuntos Económicos y Monetarios, Pierre Moscovici, ha dicho este lunes que está convencido de que Reino Unido no afrontará este viernes, 12 de abril, el escenario de abandono de la Unión Europea sin un acuerdo con las autoridades comunitarias, aunque ha dejado claro que la primera ministra británica, Theresa May, debería persuadir antes a los líderes comunitarios para que aprueben un aplazamiento. "El Parlamento británico no quieren una salida sin acuerdo. Nosotros no lo queremos. Es el peor resultado para la economía", ha afirmado el comisario europeo de Asuntos Económicos, en una entrevista concedida a France Info. "Desde luego, estamos listos si eso ocurre", ha añadido. El precio del barril de petróleo Brent, de referencia para Europa, sube este lunes hasta los 70,78 dólares, su precio más alto desde mediados del pasado mes de noviembre, después de haber cerrado el pasado viernes por encima de los 70 dólares. De este modo, el precio del barril de Brent acumula en lo que va de año una revalorización del 31% respecto de los 53,80 dólares registrados al cierre de 2018. Por su parte, el barril de crudo Texas subía hasta los 63,41 dólares desde los 63,08 del cierre del pasado viernes, su mayor precio desde noviembre. En lo que va de año, el barril de petróleo de referencia para EE UU se ha revalorizado casi un 40%. La eléctrica española presidida por Ignacio Galán presentará los resultados correspondientes al primer trimestre del año el próximo 25 de abril antes de la apertura del mercado. El mismo día, se celebrará una presentación cuyos detalles serán comunicados próximamente, tal y como acaba de informar a la Comisión Nacional del Mercado de Valores (CNMV). Barclays ha reiniciado la cobertura de Euskaltel con una recomendación de neutral y un precio objetivo de 8,5 euros, el 3,4% al precio actual de cotización. Aena es el peor valor del Ibex en la apertura, con una caída del 1%, tras la rebaja de recomendación de RBC. En las alzas, destacan los avances de Acciona y Mediaset, que rondan el 0,5%. La empresa estatal de ferrocarriles egipcia ENR ha adjudicado a Talgo un contrato para el suministro y mantenimiento de seis trenes por un importe total cercano a los 158 millones de euros, ha informado este lunes el fabricante ferroviario. Estos trenes, de larga distancia, irán destinados a prestar servicio en la ruta que une las ciudades de Alejandría con El Cairo y Asuán. En virtud de este contrato, Talgo suministrará seis unidades compuestas por una locomotora diésel-eléctrica, un coche técnico y 14 coches de viajeros. El pedido comprende además el mantenimiento integral de los trenes durante al menos ocho años. Los nuevos trenes contarán con capacidad para 492 viajeros y operarán a una velocidad máxima comercial de 160 kilómetros por hora. Alemania exportó en febrero bienes y servicios por valor de 108.800 millones de euros, lo que supone un aumento del 3,9% interanual y un descenso del 1,3% respecto a enero, según datos provisionales difundidos hoy por la Oficina Federal de Estadística (Destatis). Las ventas de Alemania a terceros países, los que no pertenecen a la Unión Europea (UE), crecieron en febrero un 4,1 % interanual hasta 43.100 millones de euros. RBC ha rebajado la recomendación para Aena a infraponderar y recortado el precio objetivo a 145 euros desde los 155 euros. la vloración implica una caída del 11% desde el último precio. La prima de riesgo de España respecto a la deuda alemana se sitúa en 109,6 puntos básicos, igual a la del viernes. Oryzon ha comunicado a la CNMV que va a presentar hoy en el 27º Congreso Europeo de Psiquiatría (EPA 2019) los primeros resultados de eficacia en pacientes tratados con vafidemstat de su estudio clínico de Fase IIa Reimagine, correspondientes a la cohorte de pacientes con Trastorno Límite de Personalidad (TLP). En este primer grupo de pacientes del estudio Reimagine se han alcanzado con éxito todos sus objetivos primarios y secundarios. La libra esterlina cae un 0,4% en la tarde de este viernes, mientras que la Bolsa británica sube un 0,5%. La rentabilidad del bono de EE UU a 10 años suben hasta el 2,53%, su nivel más alto en dos semanas, desde el 2,51% de ayer. La economía de EE UU creó 196.000 empleos en marzo, por encima de los 177.000 esperados por los analistas. La tasa de desempleo quedó en el 3,8% (sin cambios) y los salarios aumentaron un 3,2% por debajo del 3,4% previsto. Essilor ha presentado un Expediente de Regulación de Empleo (ERE) de traslado colectivo que afecta a 54 trabajadores de su planta de Barcelona, según ha informado CC.OO. de Catalunya en un comunicado. El destino de los trabajadores, que suponen casi el 90% de la plantilla (62), será la planta que tiene en Madrid la empresa dedicada a las lentes oftálmicas. El periodo de consultas, que durará 15 días, ha empezado con una primera reunión este viernes, en la que la dirección ha trasladado el informe técnico al comité de empresa. Durante estas dos semanas se negociará el número de afectados y las condiciones, con reuniones convocadas para los días 9, 10, 12 y 15. Hasta el momento, el comité de empresa ha propuesto aumentar de 300 a 700 euros mensuales y de seis a 17 meses las ayudas que la compañía había ofertado para los afectados, así como que la compañía pague la fianza del alquiler, entre otras medidas. El consejero delegado del banco estadounidense JPMorgan Chase, Jamie Dimon, obtuvo una remuneración total en 2018 de 31 millones de dólares (26,7 millones de euros), lo que supone multiplicar por 381 el salario mediano de los trabajadores de la entidad, situado en 78.923 dólares (70.285 euros) anuales, según ha informado la firma. La compensación de Dimon por sus labores como primer ejecutivo del banco de Wall Stret fue un 5% mayor que durante 2017, cuando percibió 29,5 millones de dólares (26,3 millones de euros). El salario base se ha mantenido en 1,5 millones de dólares (1,33 millones de euros), al igual que el bonus en efectivo, que fue de 5 millones de dólares (4,5 millones de euros). El alza se ha correspondido, por tanto, con el valor de mercado de las acciones recibidas como bonus de rendimiento, que llegaron a 24,5 millones de dólares (21,8 millones de euros).